Could Terrell Owens return to the NFL sooner rather than later? 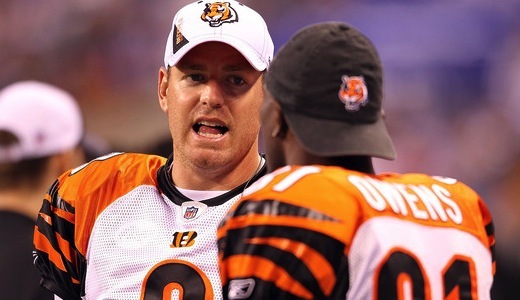 Last season the Cincinnati Bengals made a drastic move to improve the franchise offensively with the acquisition of future Hall-of-Famer Terrell Owens. With T.O. playing alongside perennial Pro Bowl wide receiver Chad Ochocinco, the consensus was that the Bengals offense would be one of the best in the NFL and Cincinnati could be playoff bound for the second straight season. Unfortunately, that didn’t turn out to be the case as the Cincinnati Bengals went from being the AFC North division champions to missing the playoffs entirely. Not only did the Bengals miss the playoffs, but they were arguably one of the worst teams in the league and seemed to be ready to go back to the drawing board to see what went wrong with a team that had so much talent. Despite the Cincinnati Bengals missing the playoffs and no longer being dominant on the offensive side of the football, Terrell Owens had a very good season with his new team and showed his doubters that he could still contribute as one of the league’s best wide receivers. Even though T.O. was impressive with the Bengals, Cincinnati neglected to re-sign him for this season and that decision might have been the result of a serious knee injury. With a torn ACL at 37-years of age, Terrell Owens wasn’t exactly a desirable free agent after the NFL lockout ended and was given no consideration from any team around the league. With that being said, T.O. has been doing everything within his power to get healthy and ready for at least half the season. The perennial Pro Bowler might 37-years-old and by no means a primetime player in this league anymore, but he keeps his body in excellent shape and might be able to play this game until the age of 40 if he can stay healthy after rehabbing his knee. Reportedly, Terrell Owens will be headed to London, England to take part in festivities surrounding the annual regular-season game overseas. This is an interesting move by T.O., but might ultimately be a smart move considering that it will get his face out there and remind teams around the league that he is almost ready to return to the field. There is no question that there are plenty of teams around the league that could use a Pro Bowl caliber player at the wide receiver position like Terrell Owens, but a lot of teams will be cautious to sign the aging star as it might be a little too risky to pick up a 37-year-old coming off a torn ACL. Along with showing his face in London, England, Terrell Owens has a released a second video with the former Cincinnati Bengals wideout working out. This video is meant to show just how well his rehab is going and that he will be ready sooner rather than later. In my opinion, T.O. will almost certainly get signed when he is ready to return, but whether or not he can contribute at a high level remains to be seen.